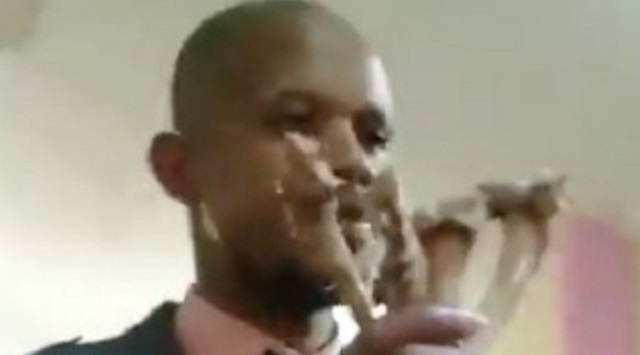 Controversial pastor Penuel Mnguni has been filmed giving his congregants what he claims to be dog meat and blood, video footage showed on the End Times Disciples Ministries Facebook page.In the video entitled, Sunday Live Holy Communion Service, a small group of people are dancing around to music before Mnguni starts preaching. “If there is anything not right inside your stomach, I’m saying today, you will recover,” he tells the group. An elderly woman is the first person to step up and is given something to eat and drink. Her lips are filled with sores and she told Mnguni that she has been sick for two months and claims that despite going to the clinic she has not been able to get better. He then passed around what he claims are dog bones for the crowd to eat. He then asks people to come forward and eat what he claims is dog meat and blood. He later showed footage of a dog being decapitated, skinned and cut up. This person said she had been suffering from headaches. After eating the apparent dog meat and blood, she fell to the floor.